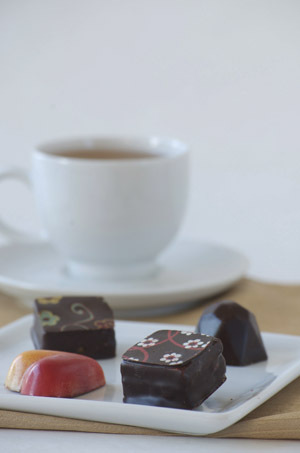 Mayana Gourmet Chocolate is known for its gorgeous creations made with modern flavors. Photo by Evan Dempsey | THE NIBBLE. WHAT IT IS: Artisan chocolates from a Chicago chocolatier. WHY IT’S DIFFERENT: Classic as well as innovative flavors, such as Hazelnut and Coriander and Peanut Butter and Jelly. WHY WE LOVE IT: Lovely to look at, delicious to taste. WHERE TO BUY IT: MayanaChocolate.net. CAPSULE REPORT: This Chicago chocolatier took home seven awards at the Chicago Luxury Chocolate Salon, including Best in Salon, Best Dark Chocolate, Most Gifted Chocolatier and Most Luxurious Chocolate Experience. If that’s not reason enough to try a box, what is? See the full review below. This is Page 4 of a five-page review of artisan chocolatiers. Click on the black links below to visit other pages. Chef Daniel Herskovic never intended to get into chocolate. In fact, his original career goal didn’t involve food at all. A classical guitarist since the age of 12, he planned to be a musician. Sometime during his stay at Oberlin College, however, he began to question his career choice. Eventually, he graduated from the California Culinary Academy, worked in some noteworthy restaurants and started his own business as a private chef in Chicago. But gradually, the siren song of chocolate began to lure him, as irresistibly as a mermaid drawing in a mariner. He took advanced pastry and chocolate master classes and studied with innovative chocolatiers including Norman Love, Andrew Shotts and the French chocolatier, Franck Kestener. 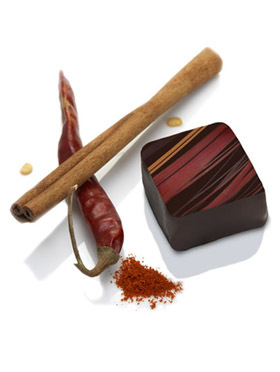 The Mayan Spice chocolate pays homage to the original spiced cacao drink. Photo courtesy Mayana. The distance between classical musician and chocolatier might not be as much of a stretch as you’d think. Both professions require an aptitude for detail, and Mr. Herskovic’s chocolates are as complex and nuanced as any performance by Andrés Segovia. The colors and patterns on the exteriors of these chocolates have been chosen with a careful and creative eye, but the selectivity of ingredients is just as evident. There are modern flavors that would not have existed 10 years ago: Cookies and Cream and Peanut Butter and Jelly, for example. There are classics such as Cherry, Passionfruit and Turkish Coffee. And there are riffs on the classics: Instead of a Cognac-flavored ganache, Chef Herskovic offers Pomme Tatin, a caramelized apple and milk chocolate ganache infused with Calvados. The Espresso-Hazelnut piece is a symphony of textures and tastes. It features a dark chocolate ganache flavored with espresso, combined with a homemade hazelnut praline. If there’s a more fortuitous combination anywhere, I don’t know about it. Those who favor greater intensity in their sweets will enjoy the Raspberry-Dark Chocolate piece, with a burst of deep raspberry flavor from a purée of that fruit. The outstanding Crème Brûlée is as lovely as it is delicious, with visible flecks of vanilla bean and crisp pieces of caramelized sugar in the sweet filling. Several chocolates that I’ve tried and enjoyed (such as the terrific Pistachio) are not currently on the roster, which changes periodically, but my guess is that they’ll be back. Note that you cannot choose the flavors to fill your box, though Chef Daniel will work with you if you give him enough time and if there’s something you can’t eat or dislike. I’m especially partial to the Chocolate Table idea for celebrations offered by Mayana: As a sophisticated alternate to the pastry sweet table, present a memorable table adorned with artisan chocolate confections for your guests to admire and enjoy. It’s a great dessert option and one that deserves to be seen more often. 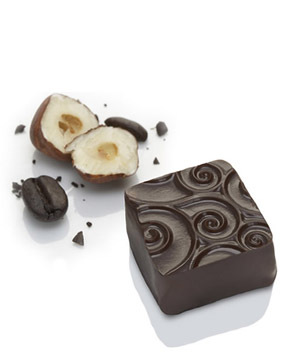 One of the author’s favorite pieces: Espresso Hazelnut. Photo courtesy Mayana Chocolate.